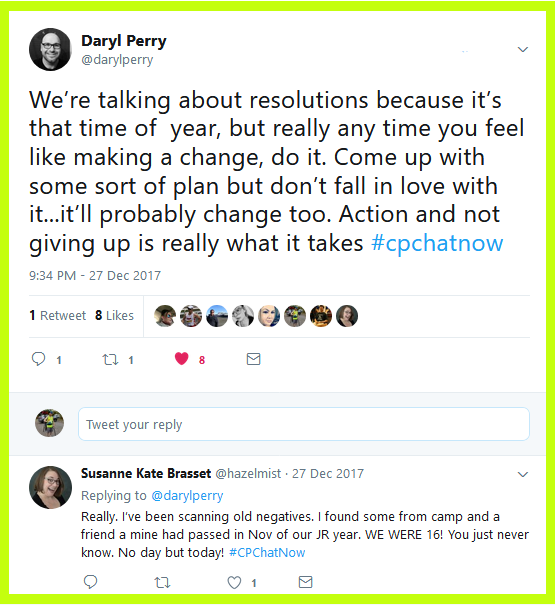 Wednesday, December 13th, 2017 remained an active evening for the live weekly cerebral palsy Twitter chat #CPChatNow. Organizing all the activity into one easy to follow recap stands my charge. 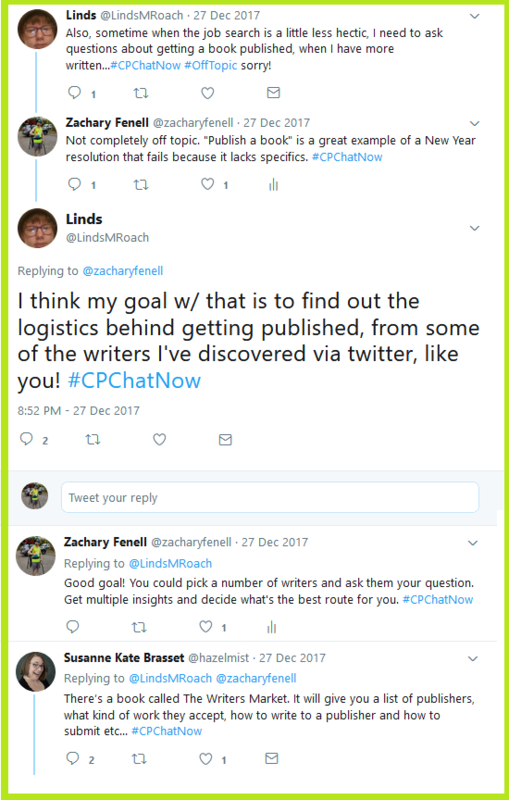 For those who do not know I am co-host Zachary Fenell. 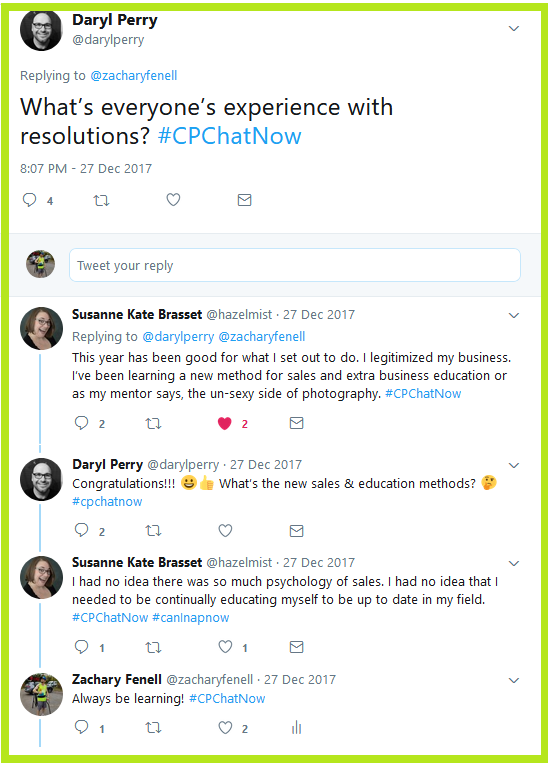 Interest from community members peaked when I announced our next focus chat. 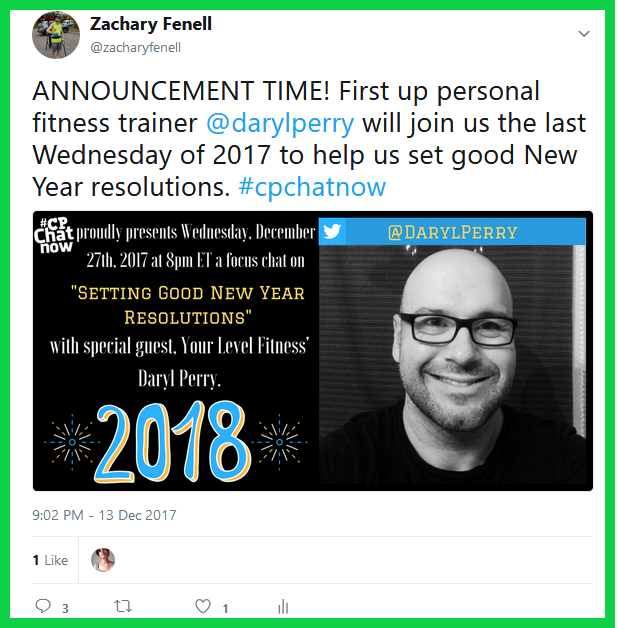 On Wednesday, December 27th, 2017 Your Level Fitness’ Daryl Perry will join #CPChatNow to lead a chat about “setting good New Year resolutions.” While a personal trainer will head up the discussion, resolutions do not need to relate to only physical goals. A fact I emphasized in an arguably too serious tweet. 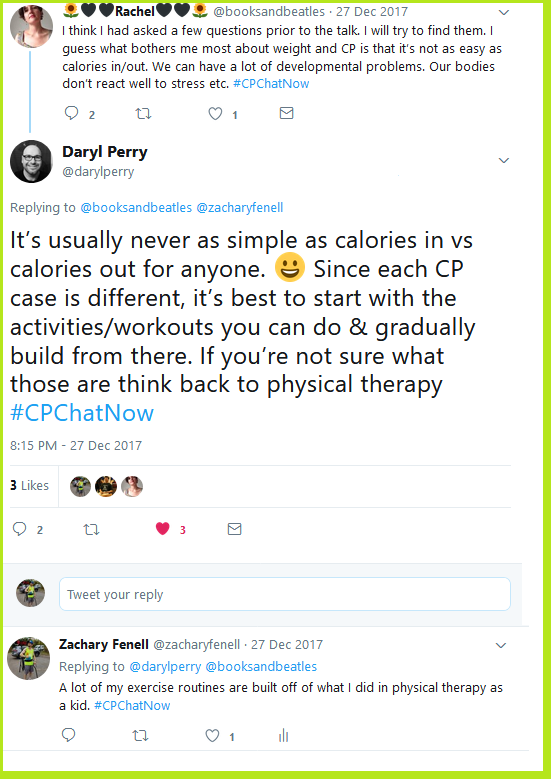 Continuing a recent running joke in our #CPChatNow community, regular Rachel asked to include cake in the upcoming “Setting Good New Year Resolutions” focus chat. 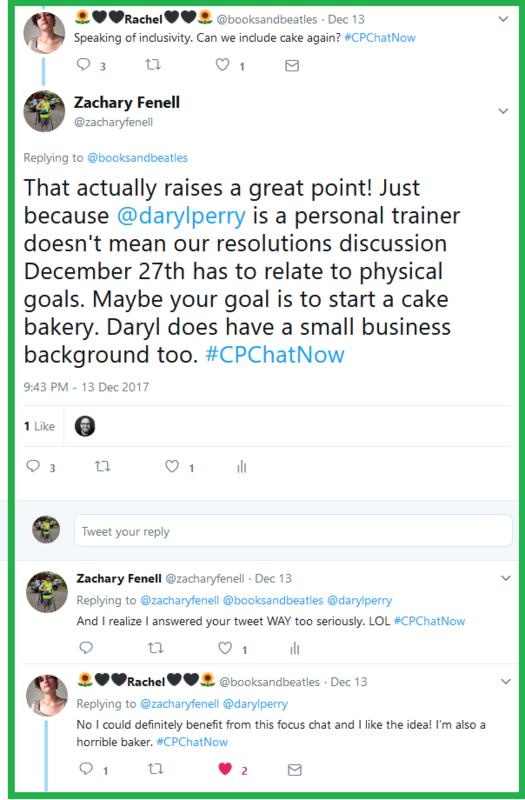 Replying seriously, I noted while Daryl works as a personal trainer the focus chat can extend beyond fitness based resolutions. 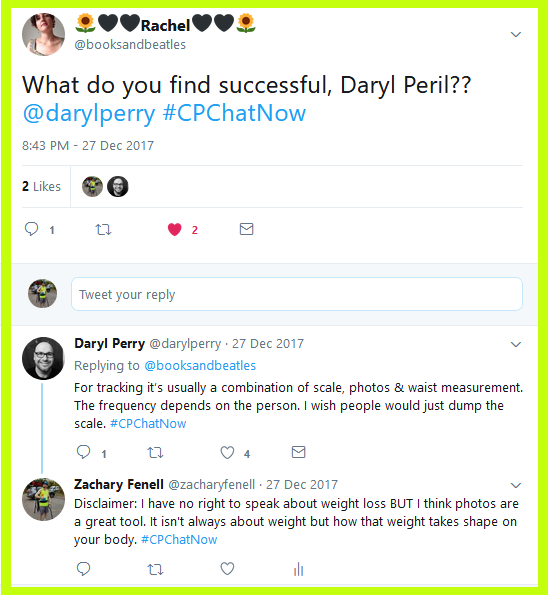 Daryl also possesses a small business background. 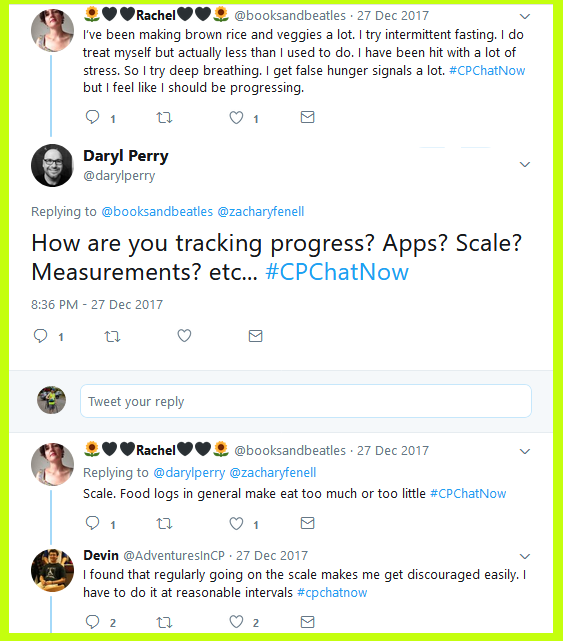 Looking to encourage my co-host, I noted many people share this issue. 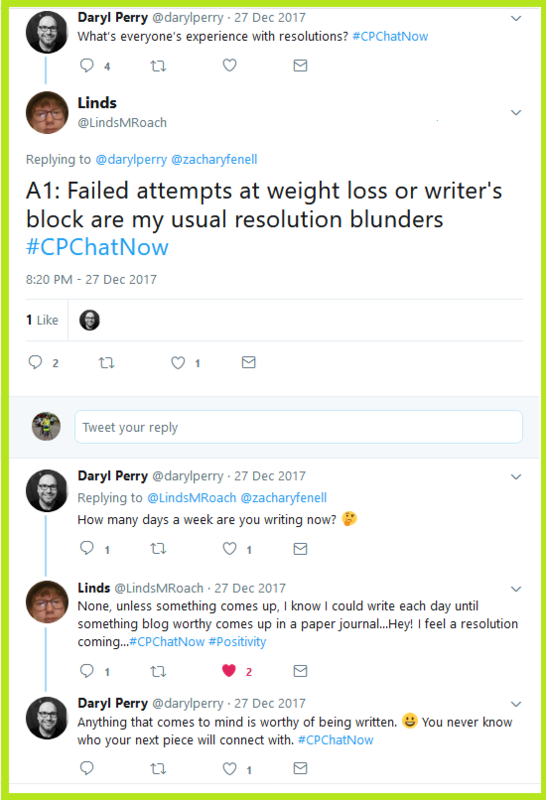 Setting unmanageable resolutions I speculated causes the lacking commitment. 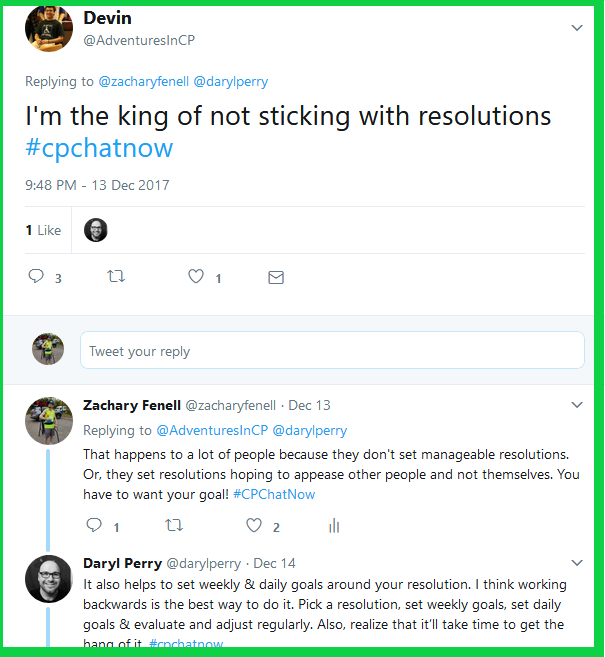 Daryl chimed in, recommending working backwards from whatever resolution you set. 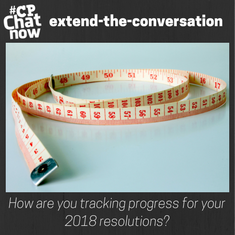 Determine weekly and daily goals you can evaluate and adjust. 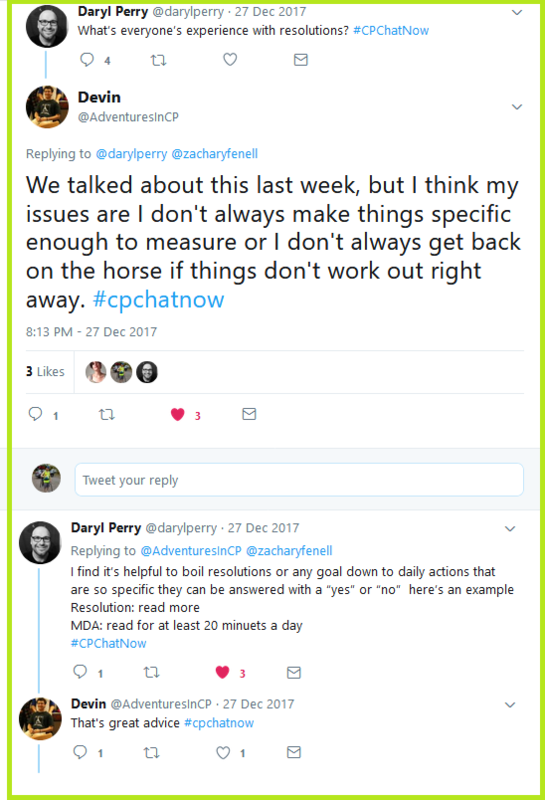 Expect more insights like that Wednesday, December 27th, 2017! 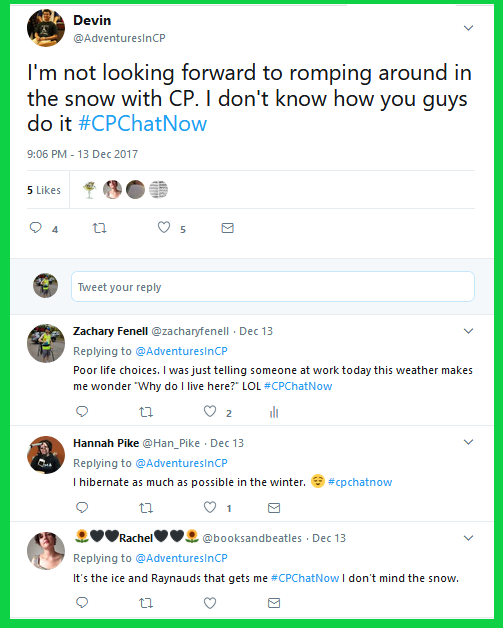 Re-focusing back to Wednesday, December 13th however, Devin raised a topic not likely to win any popularity contests within the CP community. The abovementioned topic “not likely to win any popularity contests” proved no other than snow! I joked I manage with snow due to “poor life choices.” Hannah Pike admitted to hibernating as much as possible. Meanwhile Rachel explained the snow does not bother her. 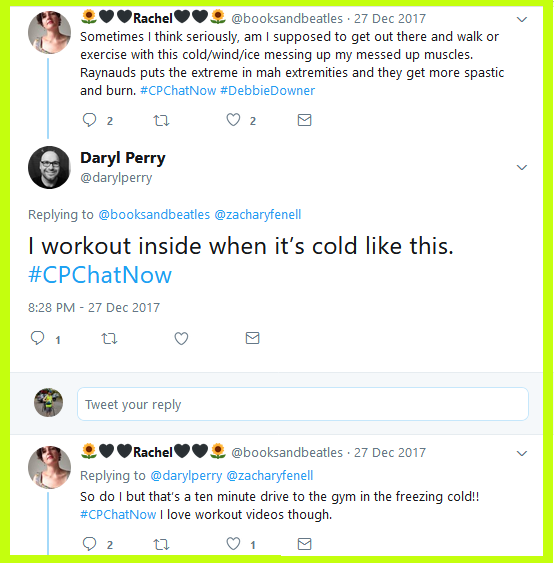 Instead she objects to the ice and Raynaud’s syndrome. Your turn now! 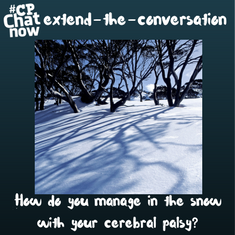 Answer for the week’s extend-the-conversation question “How do you manage in the snow with your cerebral palsy?” Leave your response in the “Comments” section. Continuing forward Rachel raised a subject which appealed to left-handers. 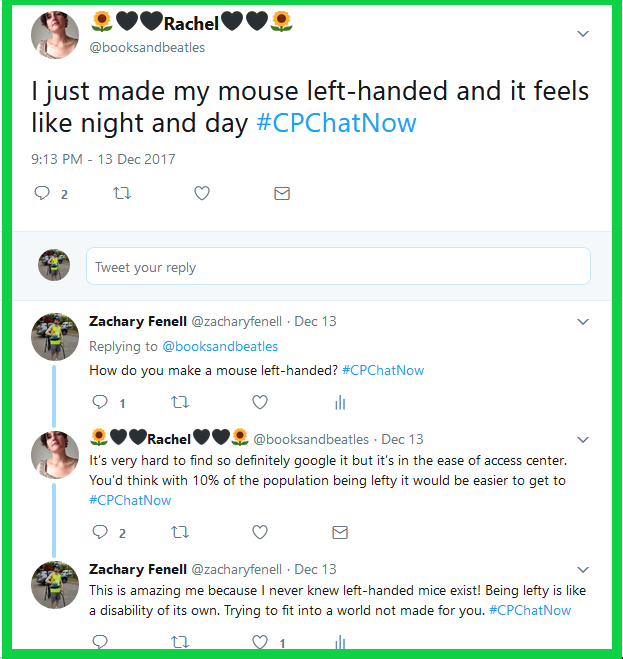 Rachel noted she recently made her computer mouse left-handed. 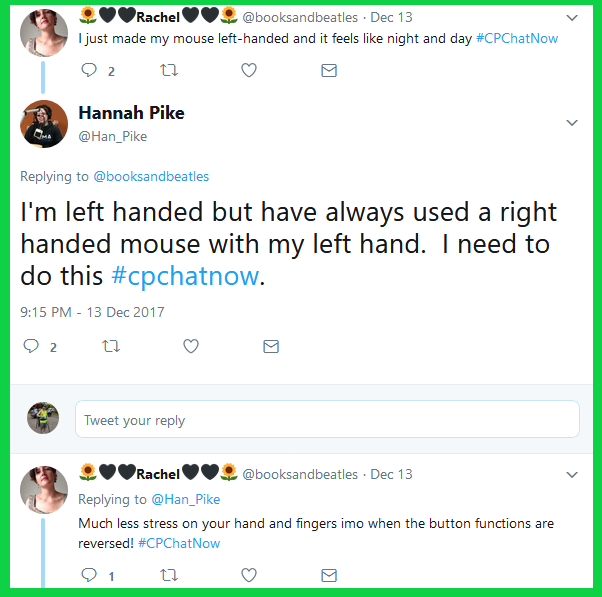 Hannah, also a lefty, expressed interest in doing the same. Personally, the entire conversation fascinated me. As another southpaw, the idea amazed me. Perhaps you can further trigger my amazement with your answer to the week’s extend-the-conversation question.